(CNS): Goodman Makanda, who lives in Khayelitsha - outside of Cape Town in South Africa - was diagnosed with multidrug-resistant TB (MDR-TB) in November 2013, when he was 30 years old. As if this was not enough, after 3 months of treatment, he was told in January 2014 that his MDR-TB had escalated to extremely drug resistant TB (XDR-TB). These two shocks, coming in such quick succession, not only devastated him mentally, but baffled him too: "I had never contracted any type of TB before. Moreover I did not show any symptoms of TB like coughing, sweating or weight loss. One day, all of a sudden, I just vomited blood. So I went to a private doctor, who directed me to a government clinic. There I was diagnosed first with MDR-TB and then XDR-TB. There were too many unanswered questions in my mind. I had been made to understand that if one did not complete the normal (drug sensitive) TB treatment, then it could lead to MDR-TB. But in my case it was MDR-TB that attacked me directly. I had no clue as to why and how it had happened." This was a very stressful period in Makanda’s life. He was on 18 tablets a day plus one painful injection. He was also on insulin because of his diabetes, with which he has been living since 2002. The side effects of TB medication were terrible. He would feel drunk, drowsy, tired, listless, lost his appetite, and would not want to walk or talk to anyone. Slowly, Makanda came to terms with his predicament. He said to himself: "It is me who is sick, and not the counsellor or the nurse. Once I change my attitude to a positive one, the medication is bound to work. If I am negative in my mind, treatment will also show negative results. So accept yourself for what you are and then everything will fall in place." Recently, there has been a blessing in disguise in Makanda’s life. He is one of the very few fortunate patients in Khayelitsha who, through the untiring efforts of Médicins Sans Frontières (MSF), have been put on treatment with Delamanid - one of the only two (the other being Bedaquiline) new drugs to become available in the the past 50 years, that are effective against the deadliest strains of the disease, including MDR-TB and XDR-TB. It is estimated that up to two thirds of the nearly half a million people who acquire drug-resistant TB each year globally could benefit from Delamanid. The drug is particularly important for South Africa, which has one of the highest global burdens of MDR-TB with 18,000 cases diagnosed in 2014. At least 7,000 people a year could benefit from this drug in South Africa, according to WHO guidance for using Delamanid. But, with the Japanese pharmaceutical manufacturer Otsuka, putting a prohibitively high price tag of US$ 1,700 per treatment course for Delamanid, the drug is out of reach for most of those in urgent need of it. Interestingly, even though South Africa is one of the sites for Otsuka’s clinical trials on Delamanid, the company has still not yet filed for registration of the drug in South Africa. To date, Delamanid is only registered in four countries (Germany, Japan, South Korea, and the United Kingdom). MSF recently gained access from Otsuka to a very limited number of Delamanid treatment courses for use in South Africa, and in the past three months, has started five patients in Khayelitsha on regimens which include the drug, Makanda being one of them. He has been on Delamanid, in conjunction with other drugs in standard regimen, since November, 2015 and will have to be on it till May 2016, as it has to be taken for 6 months. Within one month of starting on the drug, he felt a remarkable improvement in his condition - "Since I have started taking this medicine, all my debilitating side effects have vanished and you can see how healthy I have become (He indeed was in the pink of health, when I met him in December 2015). But most people still have to continue with the old medication for drug resistant TB and the treatment is very challenging, as was in my case. But I overcame them with sheer will power." From his personal experience “Ignorance about TB is the biggest bane and stumbling block in controlling it. Due to lack of correct information, there still is a lot of stigma attached with TB. 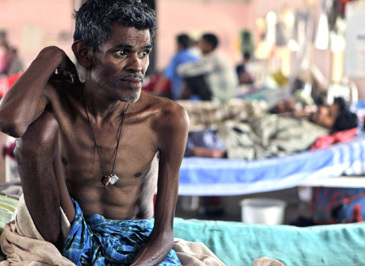 It is a general belief that only people who are dirty or do not get enough food to eat can get TB. This may not be the case always. I was eating healthy food, but still I got it. People forget that TB is in the air. So anyone can get it - rich or poor”. Makanda is now part of a support group with MSF and as a counsellor he helps other TB patients. “I tell them to talk about their concerns—if you experience something, talk about it. We cannot buy TB from a shop—if we did, we would return it to the shop and say thank you- I do not want it. They love it when I talk to them like this. It helps them to get rid of self stigma. So we have to educate them and talk to them as friends. TB is curable. It can be defeated with proper treatment coupled with a strong will power. This message has to go out loud and clear”. Makanda’s sane advice is that to control MDR/XDR-TB, we must focus on eliminating drug sensitive TB and ensure that people complete their treatment. “If we want to end TB, we cannot start by cutting the branches of the tree. If you do not want the tree of TB in your yard, do not merely cut the branches, but cut off the root, so that the tree cannot grow again. MDR/XDR-TB are just the branches of the normal TB tree. I got MDR-TB directly from the air and it was there because someone else interrupted treatment of their normal TB. So let us dig the problem from the ground level, then the branches will die automatically”. The lack of good and affordable drugs, increasing levels of resistance, and the sheer number and breadth of MDR/XDR-TB cases present a grave global challenge. If left undiagnosed and untreated, the disease will continue to spread and kill. Dr Mario Raviglione, Director of Global TB Programme at the World Health Organization (WHO), too voiced his concerns about the high prices of the two new TB drugs at a webinar (online at: www.bit.ly/mar16-recording ) in the lead up to World TB Day 2016 recently hosted jointly by CNS (Citizen News Service) and the International Union Against Tuberculosis and Lung Disease (The Union). He insisted upon creating a market dynamics which are correct and good and which will allow some of the highly expensive drugs to have a price which is more acceptable.